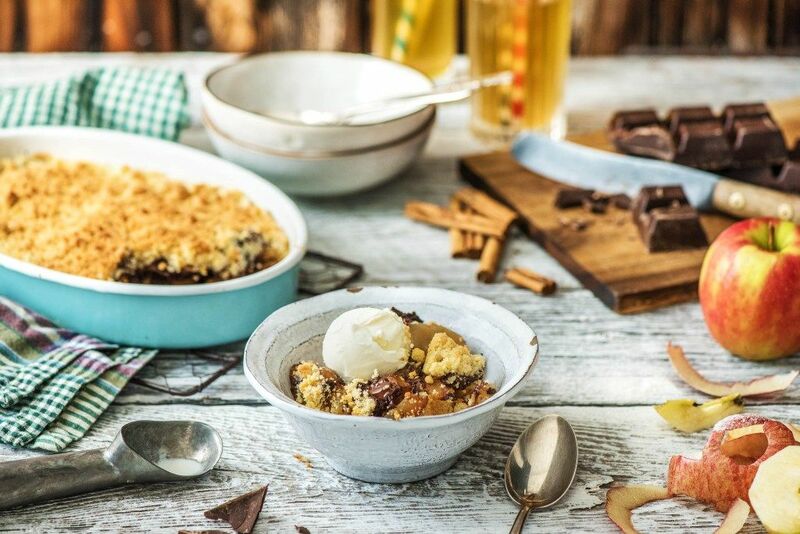 We created this recipe alongside HelloFresh as part of their blog post about apple crumble recipes with a twist, make sure you check it out! And make sure to have a read of their version of the classic dish where they add dark chocolate (talk about ultimate indulgence right?!) as well as other recipes from Forever Baking and Hello Cuppies! 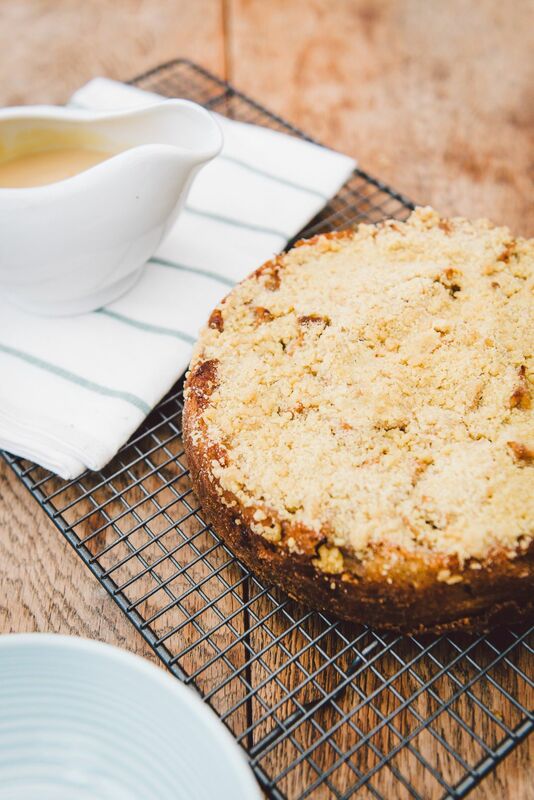 So to make our twist on the usual (and don’t get us wrong, very tasty) apple crumble, we decided to make this apple crumble cake. 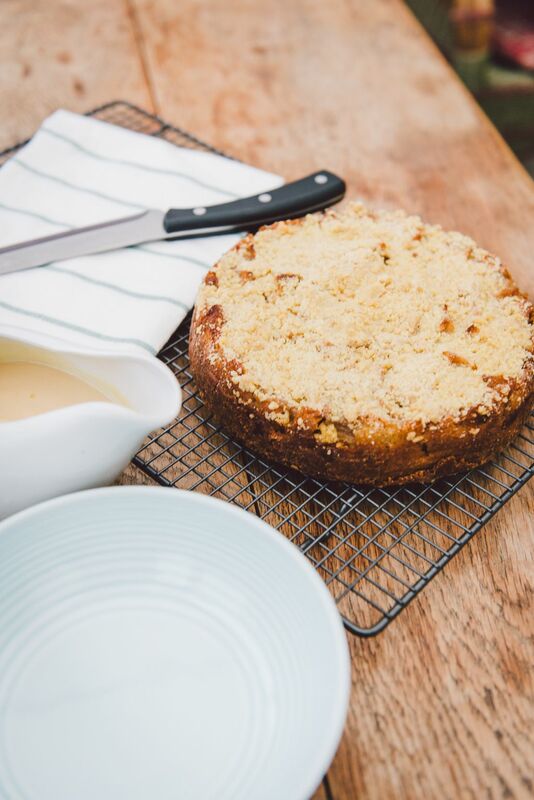 A moist ginger sponge topped with sugary apples and a ginger crumble topping. 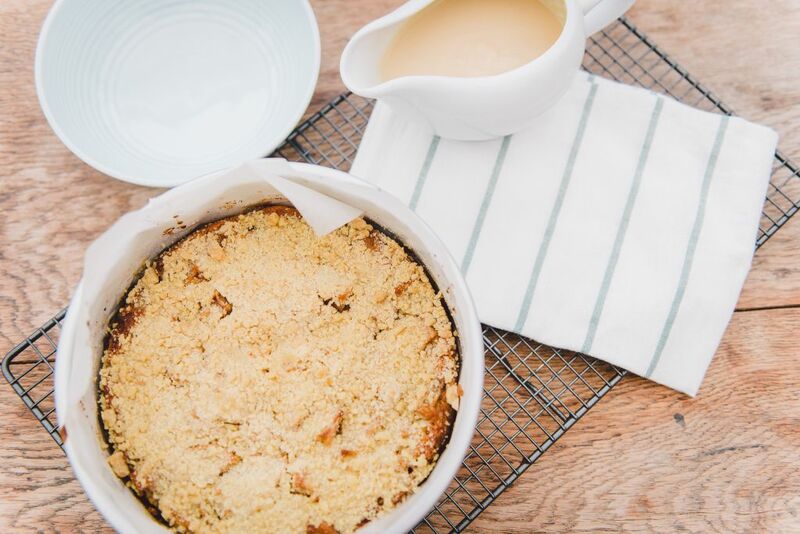 We really love adding ginger into the mix as we feel it really lifts the flavour of the apples. 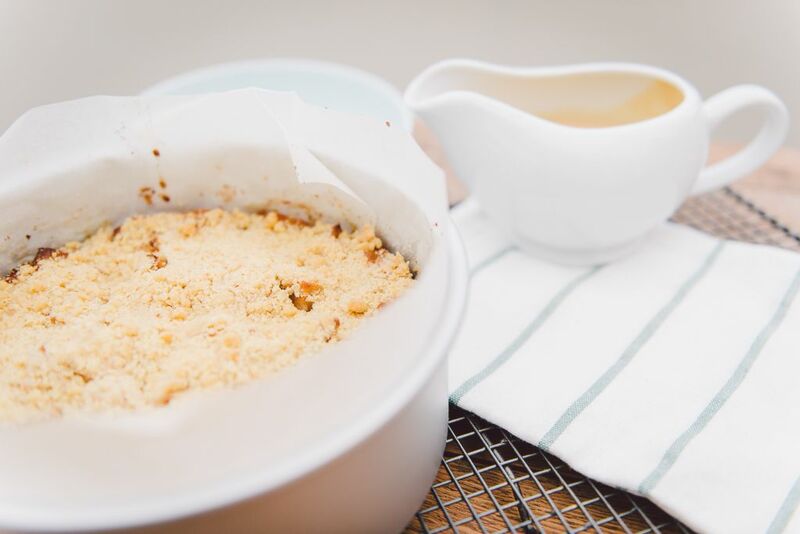 One of the great things about a crumble is how easy it is to make. A truly hassle free pudding, mix up some fruit whack on the topping and shove it in the oven, then wham, bam, thank you mam! 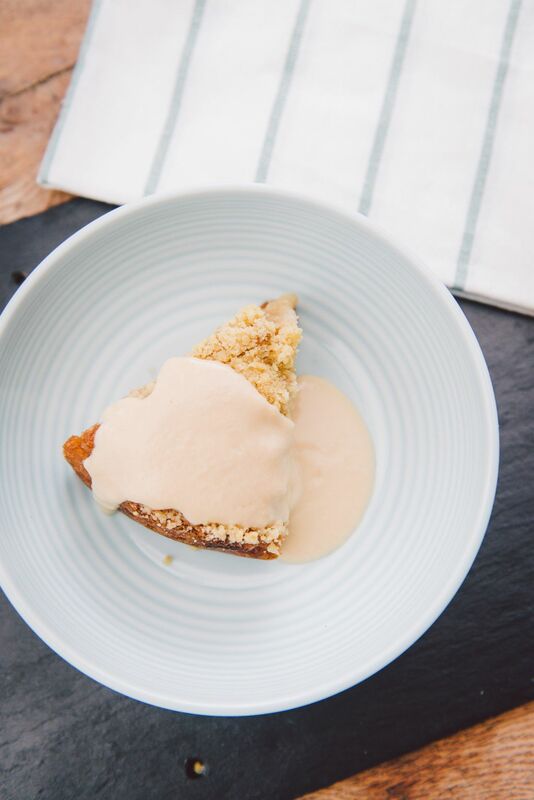 A fantastic dessert on the table. Promise us when we say adding a sponge base into the mix really isn’t that much more effort and is truly worth it. The sponge recipe is fairly routine, creaming the butter and sugar, adding the eggs then flour and a little milk. There a slightly higher butter content than a regular victoria sandwich for example as we feel this pudding needs a denser and really moist sponge. 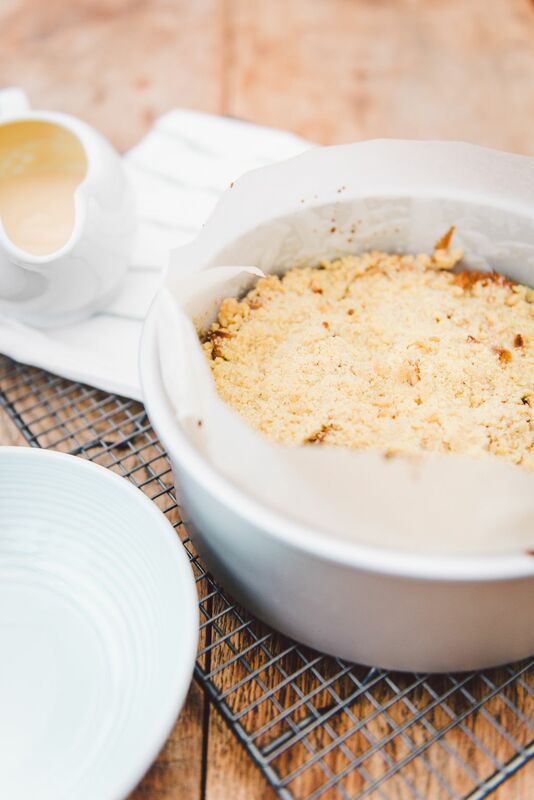 Once the batter is made and you’ve prepared your apple, it’s just a case of popping them in a cake tin and baking! 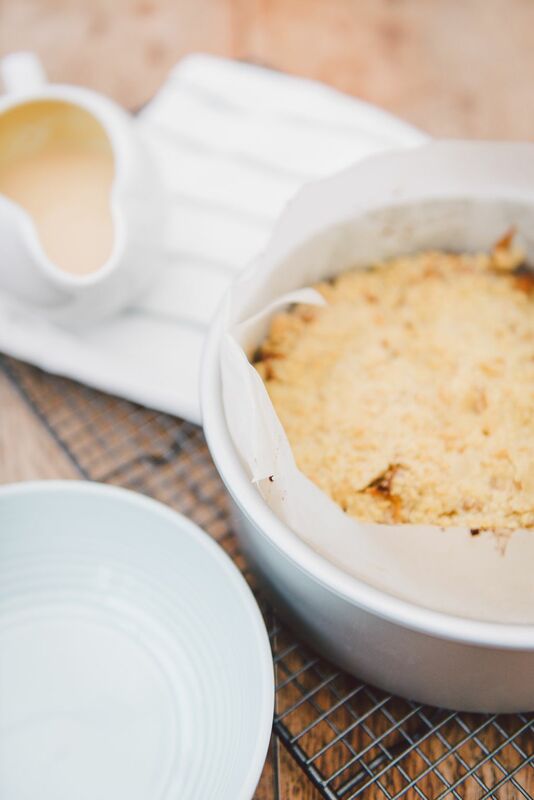 The crumble shouldn’t be added till later otherwise it’ll be baked for too long and can burn, we add it for the last 10-15 mins of cooking so that it can turn a lovely golden brown. 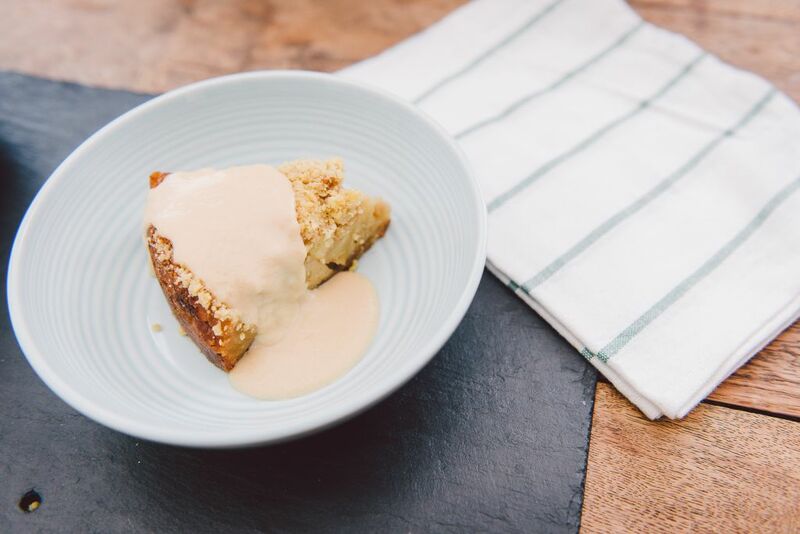 For this pudding we of course needed custard, and seeing as caramel and apples are a great combo (hello.. toffee apples!! in fact we’ve made deliciously ooey gooey toffee apple buns before) we figured what better than to make caramel custard?! 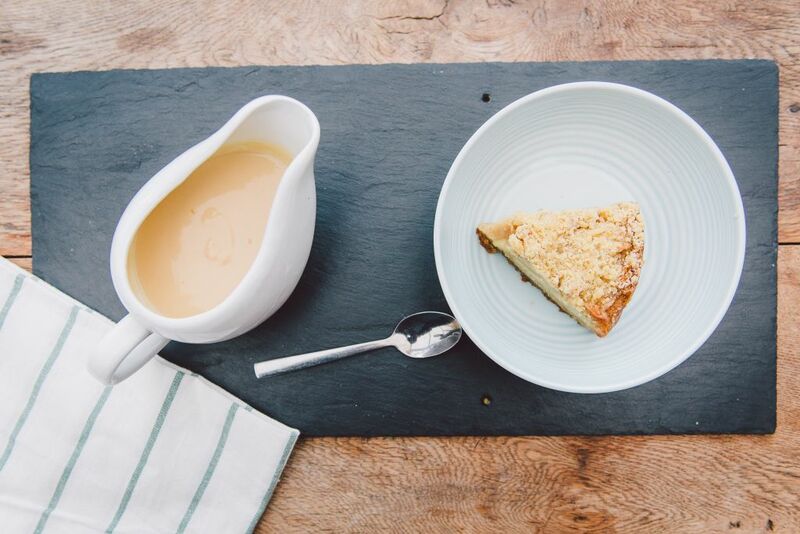 And trust us, there is nothing better, we may never go back to normal custard again! 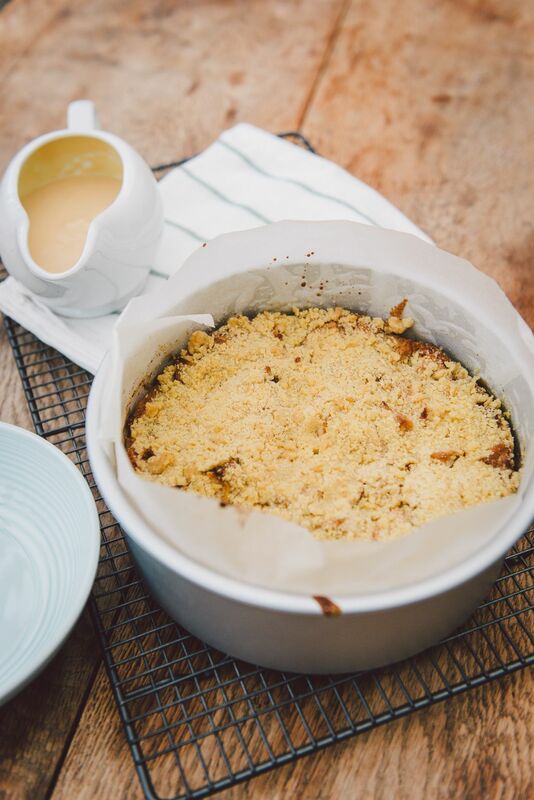 Bake at 180 for 40mins or until it looks mostly baked, then remove from the oven, sprinkle the crumble over the apples and bake for a further 10-15mins to brown the crumble. Check it's cooked by inserting a skewer, if it comes out clean then you're good to go! 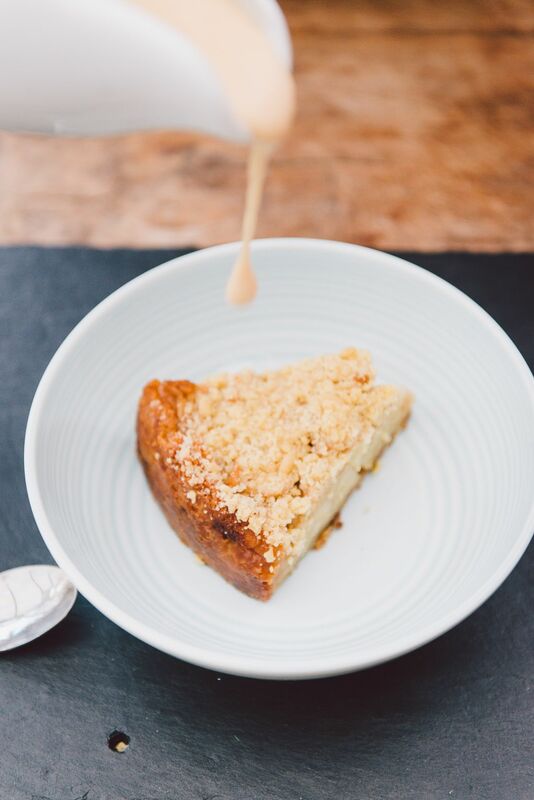 Serve warm with custard, or at least wait until it’s been out the oven long enough it doesn’t burn your mouth although we know that’s not so easy… In particular we suggest this heavenly caramel custard, it’s lovely and sweet but with a rich caramelly flavour instead of the usual vanilla (AKA it’s delicious). Oh yes! This looks delicious! 🙂 Why have I never thought of caramel custard before! Thanks so much! We don’t know why it took us so long either!! 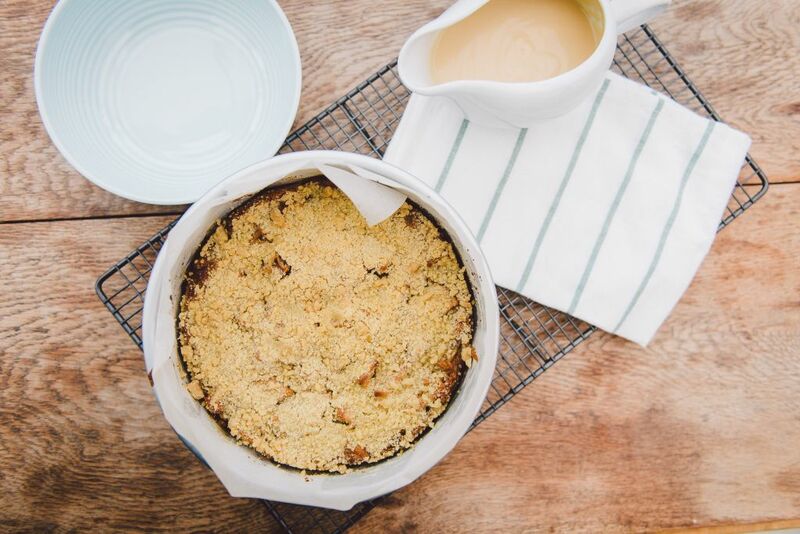 We love your recipe, definitely going to add blueberries into all our apple crumbles from now on!